In 1860 Monet was drafted into the military and sent to Algeria. During these years of service Monet did not paint at all. Upon his return to Paris he picked up where he left off and began painting again. 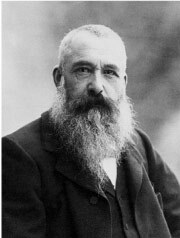 Monet also met Camille Doncieux in Paris, and then married her in 1870. Camille modeled for many of his paintings. 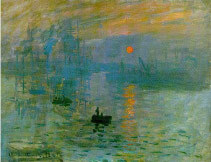 In his later works Monet continued to capture the affect of light. Sometimes he would paint the same object over and over again, but at different times of day or year. Examples of these works include his haystacks, morning views of the Seine, the Gare Saint-Lazare, Poplars, the Thames, Rouen Cathedral, and his celebrated series of water lilies. Impression, Sunrise began the Impressionist movement. Its subject in the harbour of Le Harve in France. This work is one in a series of approximately 250 paintings. 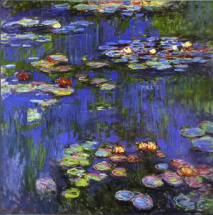 The paintings depict Monet's flower garden at Giverny, France.